Colleen Mills, researcher into racism and hate crime at John Jay College of Criminal Justice, NY, presents a discourse analysis of Fox News Channel’s coverage of the police shooting in August 2014 of unarmed Michael Brown, sparking months of black protests in Ferguson, Missouri and other US cities. It exposes how the news anchors’ and guests’ output constructed frameworks which blamed black victims in the characterisation of Michael Brown and his shooting death, blamed black leaders, blamed the black community and attacked the black protesters and their movement against police brutality. 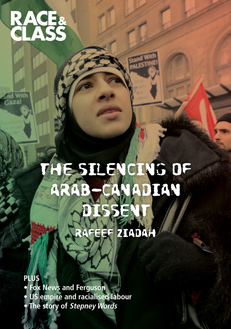 Postdoctoral Research Fellow at Soas, Rafeef Ziadah, examines state funding cuts to Canada’s most prominent and active Arab community organisations, in the context of debates about a ‘crisis of multiculturalism’ imbued with anti-Arab/anti-Muslim racism and the silencing of Palestine advocacy efforts. She shows how the shift to a neoliberal multiculturalism, emptied of anti-racist politics, along with the construction of national identities around western ‘core values’ has advanced a marginalising politics that demarcates a ‘civilisational’ border which excludes Arabs, Muslims, and, by extension, Palestine solidarity. I don’t agree “Palestine solidarity ” should be included in the construction of any core western multiculturalism. the situation between Israel and Palestine is very pernicious but it is a foreign affairs matter and becomes highly divisive to take a side; how do we know that one day the tables will not reverse with a successful horrific attack on Israel soil and mass casualties of Jews. It’s a religious and territorial dispute. It links into various shifting power alliances, and even capitalism itself – because of the oil interrelationships with Gulf states. It furthermore implies, perhaps, taking a side on an issue like Wahhabism and its links to neo-salafism, which grows from within gulf states, is exported from gulf states, turns muslim minds in the west away from peace and into a mentality of jihad linked to all of the above “oppressions” and “solidarity”, and this from time to time results in a person taking the decision to kill and maim large numbers of civilians in Western citizens. Under the current climate we cannot possibly take “a side” in regard to the Israel-Palestine situation. It is not essential that pelstinian sentiments are expressed within a core framework of an independent sovereign nation which lacks a majority muslim population of its own. Any more than it is essential that an orthodox and / or zionistic jewish voice should be especially integrated into that framework. Those are important voices inside of specific regions of the world for which these politics are critical discourse in those politics. They are not foundational matters within a western framework, which could inadvertently find itself incorporating some of the flavour of a “justified jihad” as a result of it. The issue is very animating both ways, indeed, there is a rising antisemitism just as much as anti-islam trend, since various white supremacy groups are latching onto the idea that Hitler was right, etc. That’s another danger. So … taking a side on Israel-Palestine would be a mistake in all cases. There is nothing one can say which might not inadvertly channel in to one or other extremism (far right on islam, far right on jews, or exciting the cause of jihad against civilians in the west). Given these facts let activism have its place. Let foreign policy have its place. But do not let a stance on foreign policy, or a specific activism, become foundational. It ceases to be possible to build a fair and balanced discourse about an independent state if you would do that. The west has its spaces available for cultures of every kind, but cannot be tempting a greater calling for jihad upon itself. This is irrational and reckless. Particularly given there are no shortage of imams in America and elsewhere who are edging awfully close to incitement of violence against arbitrary innocent jews right now. The words in the talks linger. They can say they are prophetic maybe, but in my opinion the calling is being placed there for those who are listening. Islam is a religion, not a “trans-nation”; or else any basis for defining loyalty through citizenship will swiftly break down, with an action by a country or country ally against “any muslim anywhere” giving life to a “jihad on that country in cause of retaliation”. to the extent it is a transnation, we actually have no international legal framework for negotating terms and conditions for transnational brotherhoods and sisterhoods, as such. but if we allow such a construct, then we must acknowledge the legitimacy of becoming targets of jihad operations on the basis of having attackign “muslims somewhere” (through foreign policy), or even, through having simply “interfered” at some stage, in politics of islamic world. hence there cannot be any ackwowledgement of the trans-national construct, not without self-defeating multiculturalism itself. But the term “solidarity”, which borrows from the communist term of an international worker without borders, covertly allows for the possibility of that trans-nation of islam. As a concept in the politics. In order for western criminal prosecution to remain consistent with islamic law, and therefore to be able to entertain a multiculturalism at all, it is necessary to define loyalty by citizenship, not by transnational religious identity. As a consequence of that, some of the terms placed on muslims will inevitably be binding in a western framework, and contradictory to some aspects of the theological justification for war in islam. there is just simply no getting aroudn this fact. as a religion islam is unique in providing a theological incentive to die in the path of the god. the actual act of doing it leads to glory and rewards. therefore tread lightly – and this is not islamophobia to points such tensions out. The islamic “transnation” cannot be a feature of a coherent multiculturalism, for the above reasons. The theoretical point at which muslim leaders should “declare jihad generally” occurs when military strength is approximately half that to any oppressor state or armies, etc. At which stage the command of Allah to “fight them” becomes applicable. One exception only. If there is a peace treaty in force. But that would require to be a peace treaty to which all muslims were bound, which is only possible if all muslims are under one leadership. Until that time, there are ambiguities here and given the nature of “fight allah” lingering in the distance, it is aswell to restrain the animating characteristic of the ummah concept. I think multiculturalism with tacit “ummah solidarity” as a component, in the way it is being framed here, amounts to an opiate. There have been numerous instances of moderate muslims in public funding terror organisations behing the scenes. this is an aspect of civilizational tactics. It is seen as a long, slow dawah, allah willing. Tread carefully with “ummah theoretics” . And most certainly leave the notion of transnational solidarity out of any multiculturalist framework as far as it relates to the matter of loyalty. Absent of formal peace treaty with “Muslims in general” (which cannot be written anyway as there is no caliphate), jihad is a matter of spiritual imagination and resources, only. It didn’t somehow disappear from islamic theology, and if you believe it might have, you are engaging in dangerous romantic thoughts. Previous centuries conquests and reqconquista were bloody and awful things. Treat lightly, please.